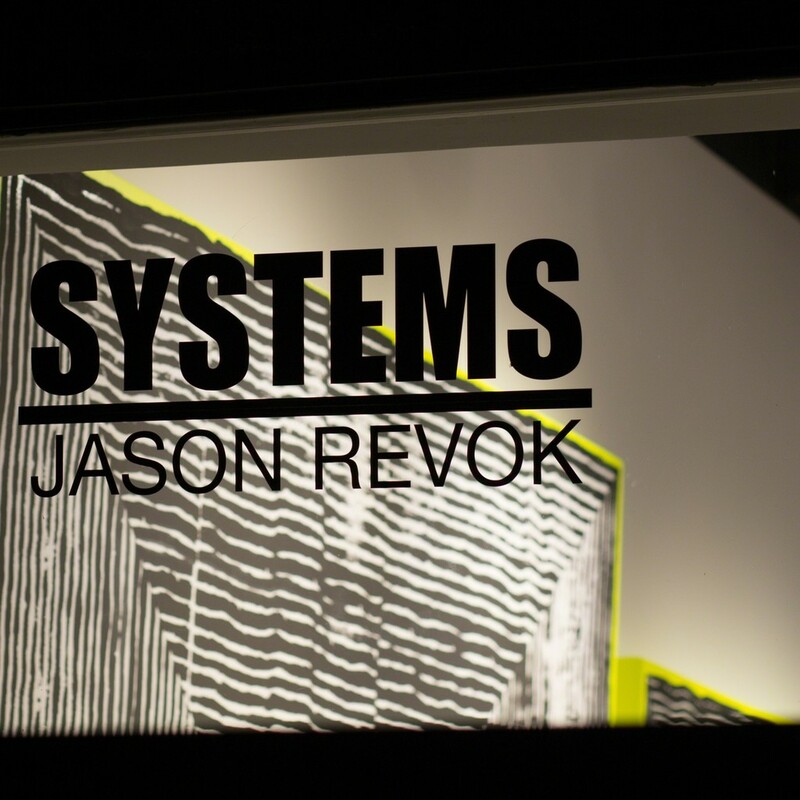 Detroit-based Library Street Collective is pleased to announce SYSTEMS, a solo exhibition by JasonREVOK and the gallery’s second in a series of LA-based shows. 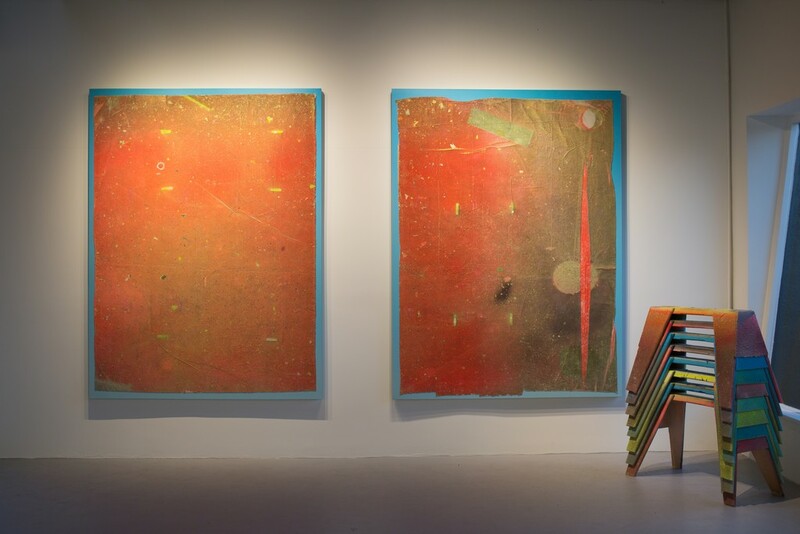 Opening on October 22nd, their Mid-City space will be filled with Williams’ hypnotic, large-scale paintings on canvas and metal that present the physical and conceptual disintegration of structures. Entirely self-taught, REVOK has become known for pushing creative and legislative boundaries that began in the street. 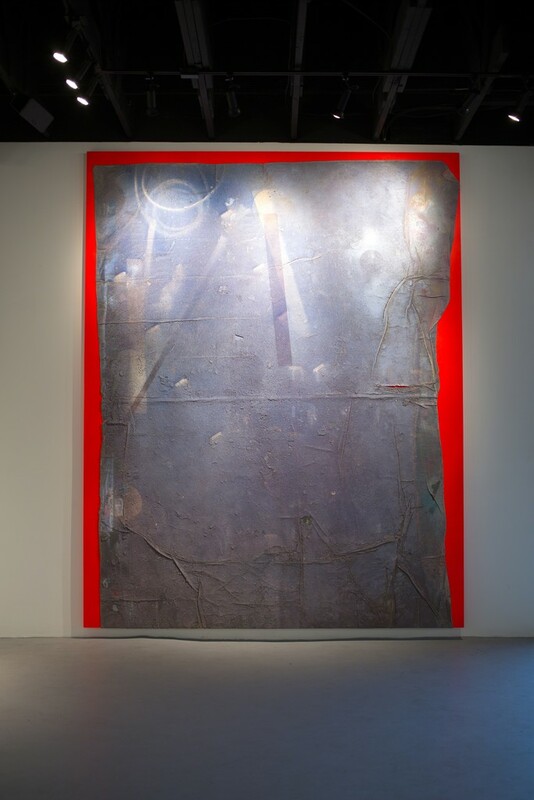 Murals and assemblages of urban decay have evolved as the artist has moved from alley to studio; arguably, he has done more to bring spray paint to minimalist art than any before. The series for SYSTEMS is familiar in its use of materials, but the methodology has changed drastically asREVOK relies on self-made tools for a process that has consumed him like no other. “I’ve never been so committed to an idea,” he says, “and I feel like there are infinite possibilities”. One such invention is an apparatus that holds 8 cans of paint and allows them to spray simultaneously. The device marks a systemof lines that move in synergy for an imperfect pattern that could never be created by hand. Turns out, the surfaces that contain these lines are metal signs he purchased from the company that manufactures LA’s wayfinding - the same metal signs the artist has spent much of his life defacing. 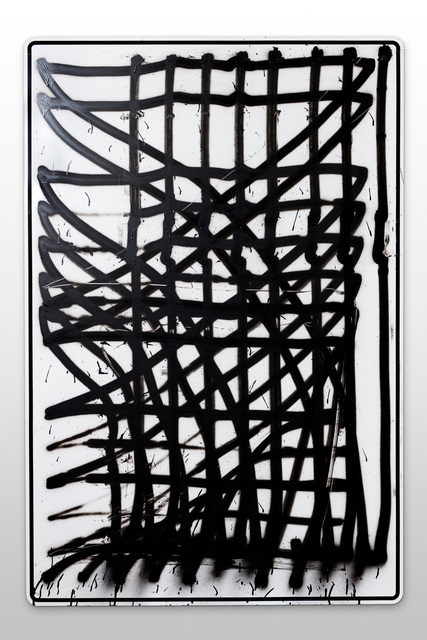 One of REVOK's long-time influences is Frank Stella, whose Black Series of the late 1960s are a clear inspiration for SYSTEMS. Stella’s focus on perfection and geometry seems dissolved in battery acid with this collection, demonstrating the erosion of postmodern practice that has happened over time. 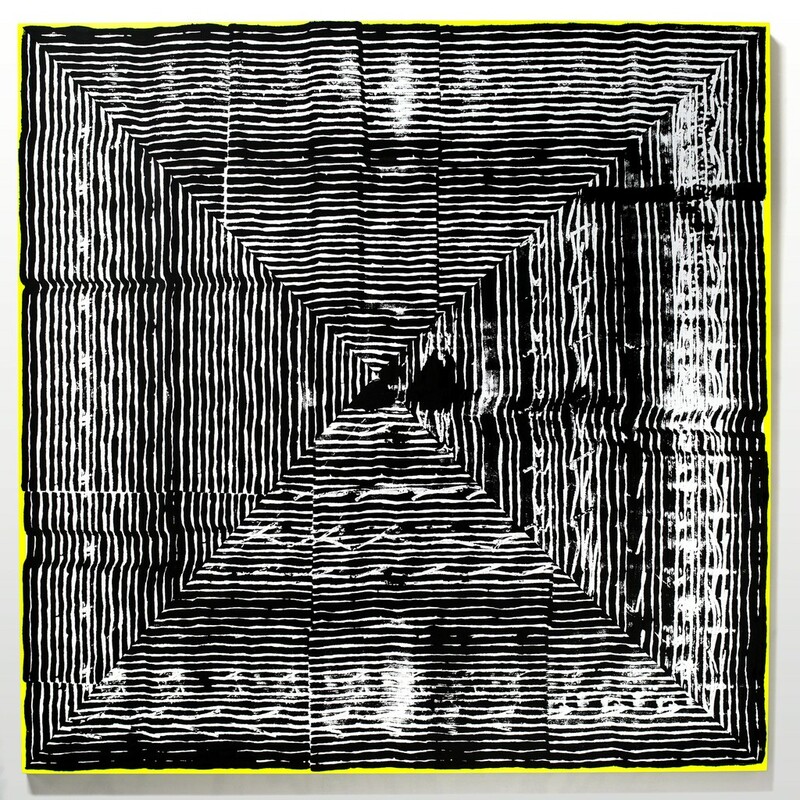 Radical then, the starkness and precision of minimalistic art can seem dated, cold; REVOK introduces gestural glitches that disrupt these exacting patterns, reminding us that there is always a human being behind the work. 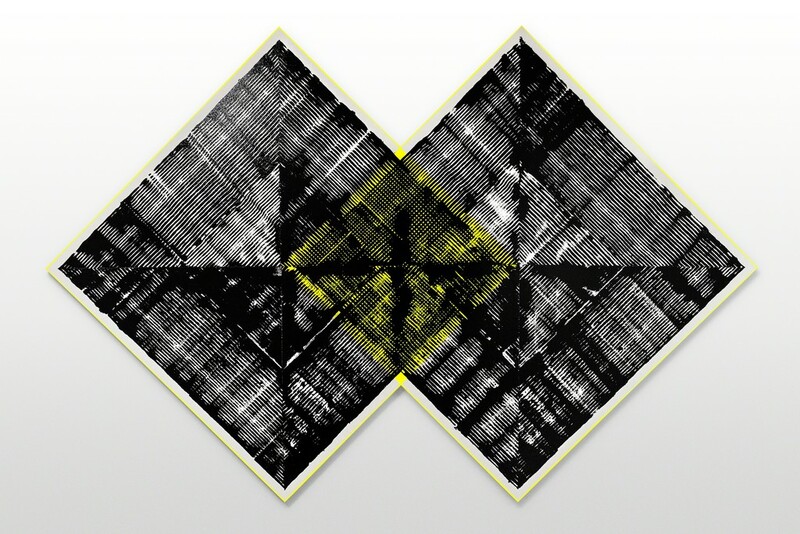 Unofficially coined the ‘Tape Loop Paintings’, these black and white canvases are also driven by the work of avant-garde composer William Basinski, who in the 80s set out to convert old easy listening tapes to digital, but instead watched his cassettes break apart as they moved through the recording spool. He kept documenting despite the interference and created an unprecedented series called The Disintegration Loops, where the music dissolves into bits before droning, interference and silence bring it to its end.REVOK creates a similar effect through paint - imperfect concentric lines interrupted by diagonal composition - which he builds up through the methodological use of a paint roller coiled in tape. As the roller spins on the surface of the canvas, the tape shifts, tears and falls off. The result is a series of works that vibrate with intensity. 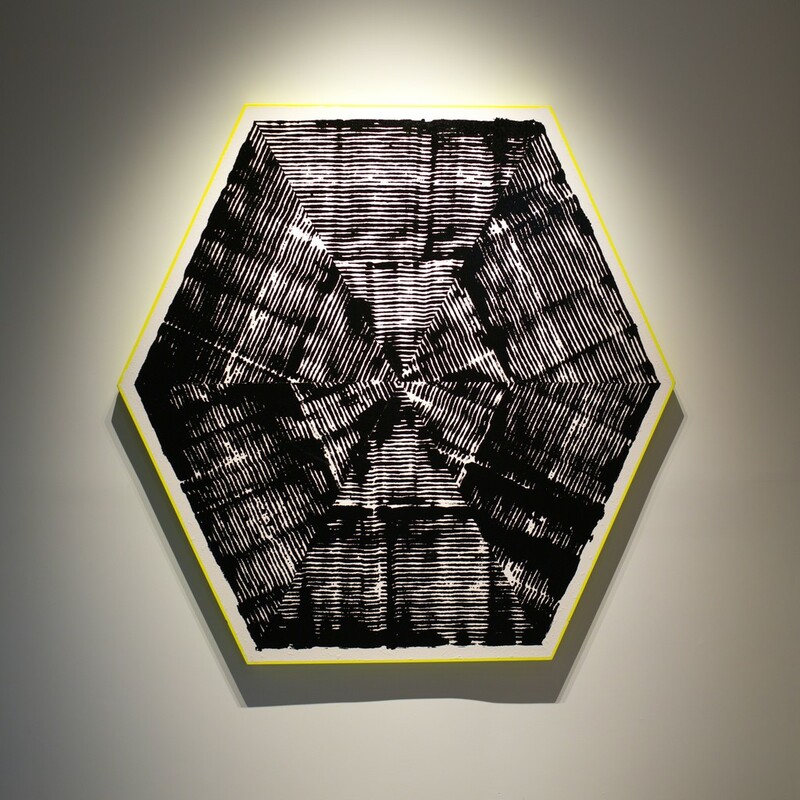 The collection is softened by additional works on metal, where intense black lines are replaced with ghosted colors that drip and dissolve. Conceptually driven, a compilation of tags are wiped away, using materials and a process the artist has reappropriated from the city workers that erase him. The tags are those of friends and family passed away; a collection of names associated by their relationship to REVOKand then scrubbed out by the friend who remembers them. What brings the works together is the commitment to concept over aesthetics, though the latter is just as strong. What REVOK has created for the first time is a system to guide his work rather than just the work itself. The joy that comes from this abandon is something new to him; a trust in his decisions, tools and materials that have allowed him to view his work in the same manner his audience might - with an appreciation for the things that can happen when we let go. Jason REVOK: SYSTEMS will be held at 5428 W. Washington Blvd in Los Angeles, within the Castelli Arts complex. The exhibition will take place from October 22 through November 12, 2016, with an Artist Reception held on Saturday, October 22 from 7-9 PM. 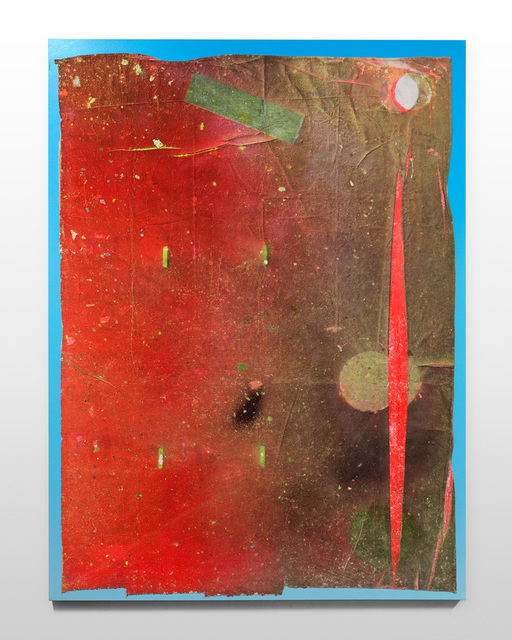 [email protected] for an exhibition catalog or additional information. 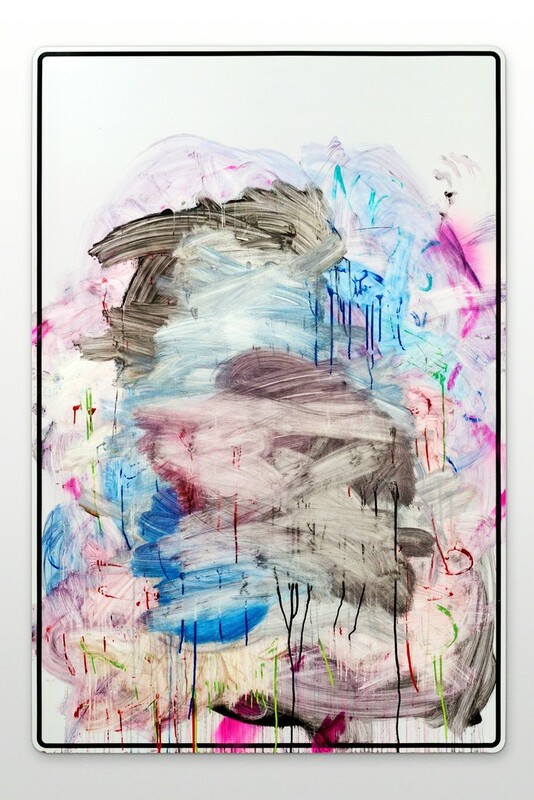 Jason REVOK is an American contemporary artist noted for his complex assemblage works. 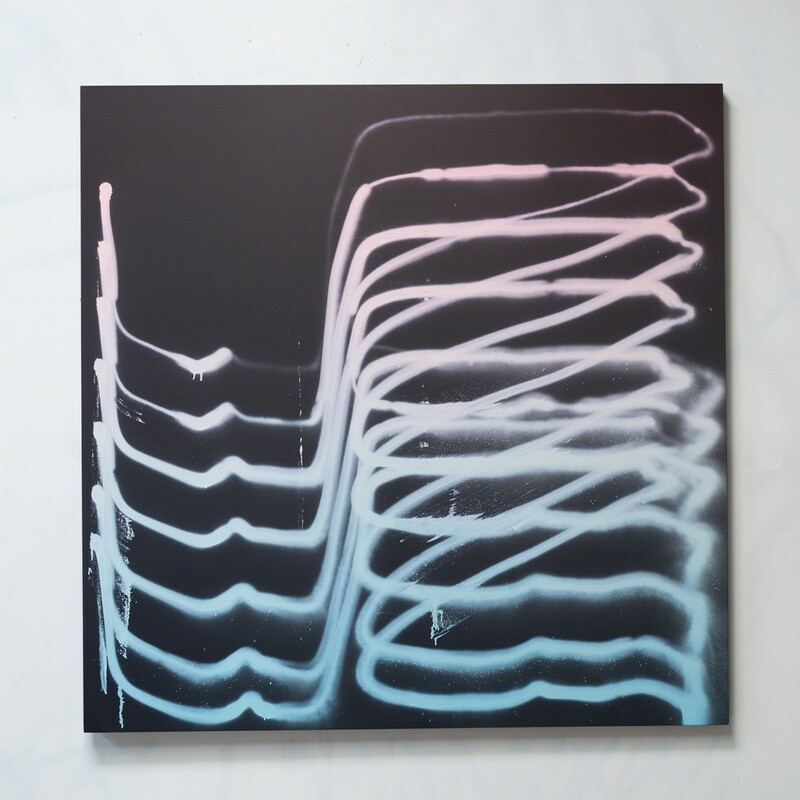 Respected for decades of influential and pioneering work as a graffiti writer, REVOK’s studio work explores deeply shared themes involving place and human experience using the very materials that make up the environment around him. 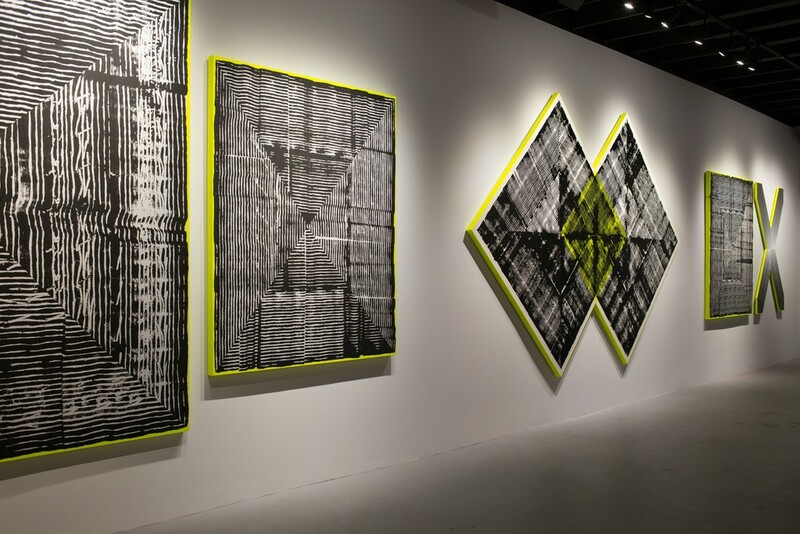 REVOK has exhibited in the Museum of Contemporary Art Los Angeles as well as The Pasadena Museum of Contemporary Art. 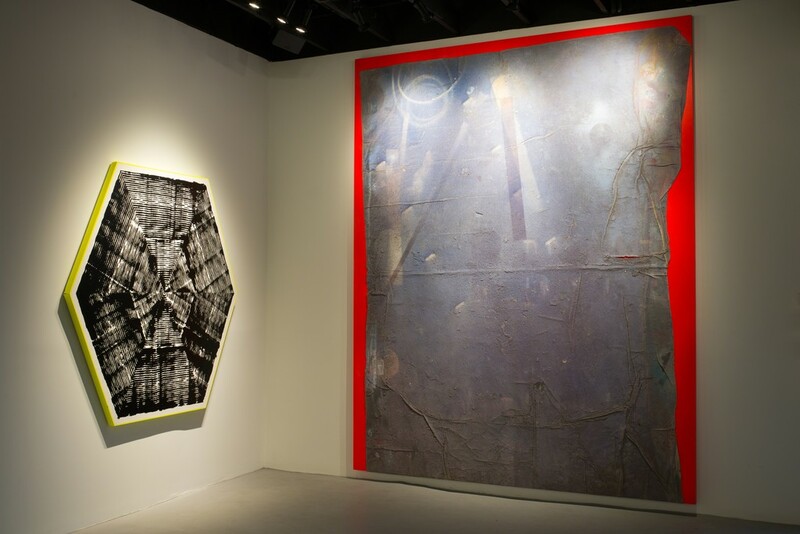 His work has been exhibited internationally in the United States, Europe and the Middle East and is in a number of important private collections worldwide.